Oliver had his first official therapy visit today! We went to Berry College to de-stress some students for a couple of hours. It was great to be back at Berry College as I had attended years ago before chronic migraines took me out of class. 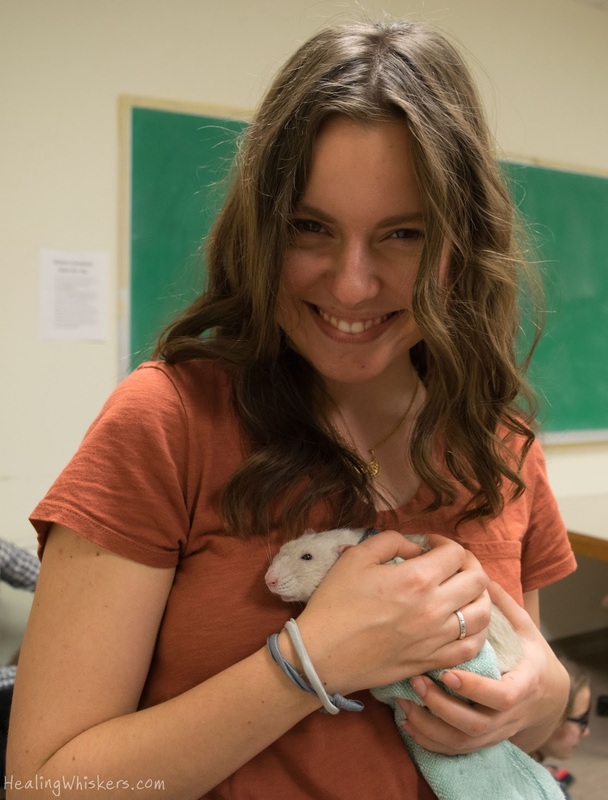 There was a de-stress event in the tutoring center of the library and we had a whole room full of dogs, students, and of course, Oliver. "Just waiting for someone to pet me..."
This visit was a milestone for him as he bruxed and boggled in people's arms. He has done this at home, but not in public situations. What is bruxing and boggling? 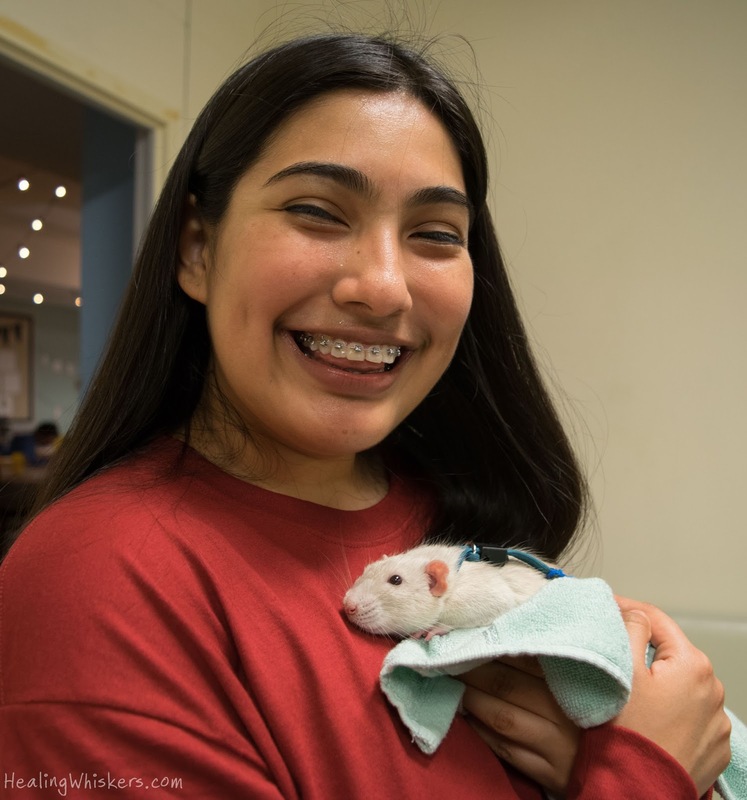 Bruxing is when a rat grinds their teeth back and forth - this could be because they are excited, happy, or even stressed. Boggling is what happens sometimes during a brux and it is when the rat's eyes bulge out. This is seen as extreme happiness and contentment. So he is really enjoying his therapy work! 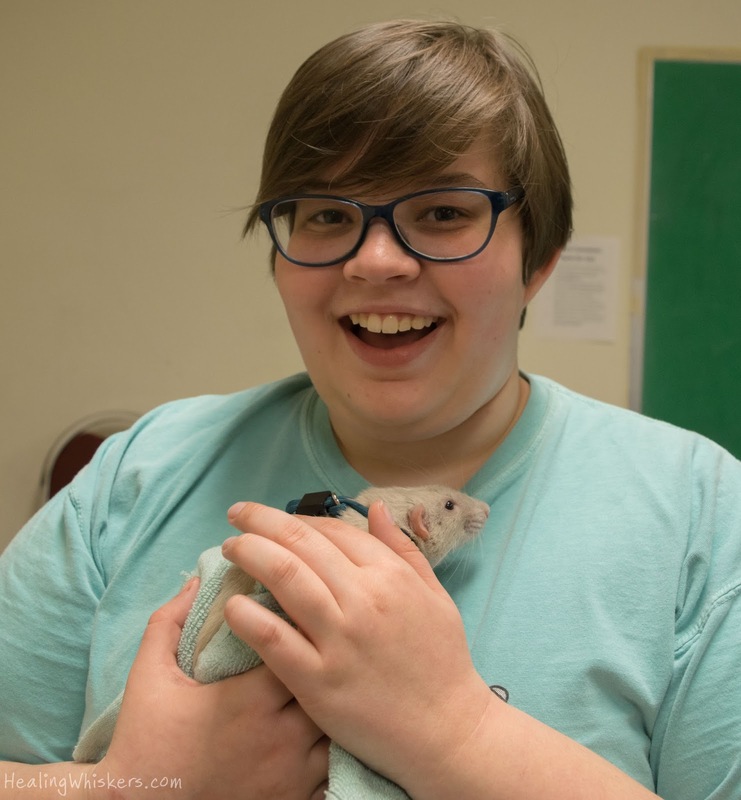 He was a big hit and most of the students loved petting and holding him. I got a good routine of showing people how to hold him: I put the towel under him, wrapped him up kinda like a taco, told the person to put your arms close to your chest and handed Oliver over. This worked really well so that Oliver was fully supported with his front and back feet. "I'll take one snooze and a shoulder rub, please"
A new thing we are doing is asking people if they want to give him a treat, then show them how to hold it (Oliver won't nibble hands, but some people might freak out how close his teeth can get to their skin) and Oliver will grab it out of their hand with his teeth. Oliver gets rewarded for working and watching him eat is fun to watch too! We did have a student who we saw a previous time (remember when we came to Berry for the Farmer's Market?) and asked Oliver if he remembered when he pooped on her. Thankfully his training has been really good and he didn't poop or pee on anyone today, haha. He did relieve himself in the basket, but it was before everything started and then once we were on the way to the car. I think he figured it was okay since we were finished. Smart little guy. Overall I am very very proud of Oliver. He isn't even a year old and he is changing so many lives. 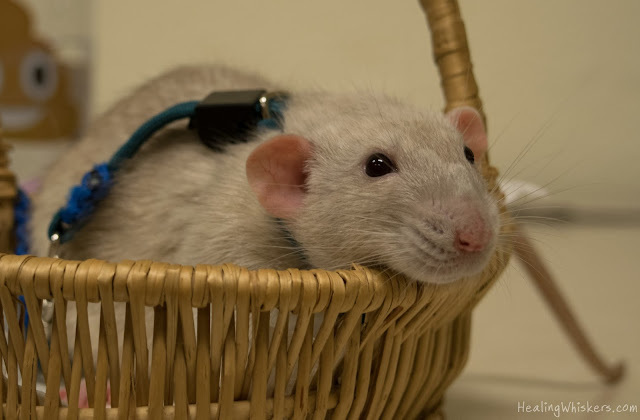 I get the comment all the time "I didn't know rats could be this cute!" and of course there are people who come back multiple times just to cuddle him a little more. 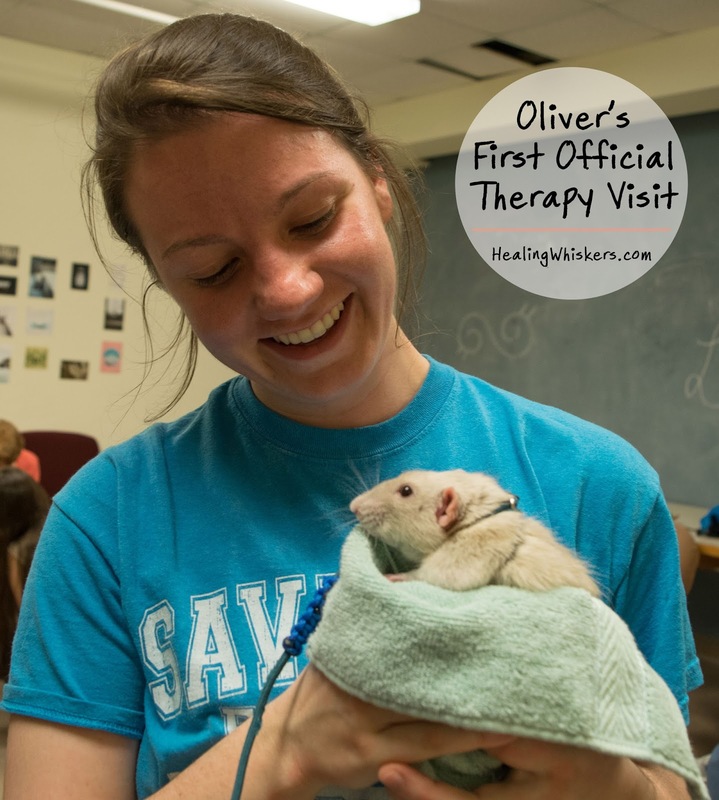 Every interaction is special and knowing that Oliver is enjoying therapy work makes me so happy! 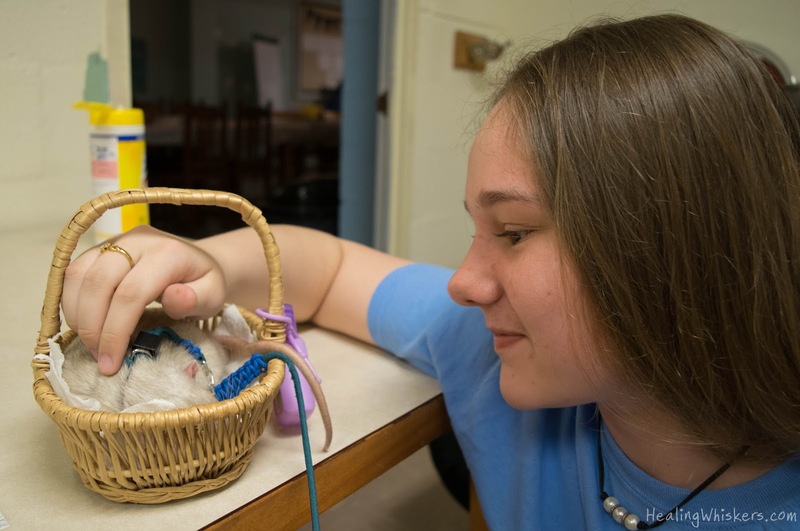 How do you know when your pet is happy?